The exploits of Jack the Ripper have been a fertile ground for writers over the last century, but most have concentrated on the deeds – or the identity – of the unknown serial killer. 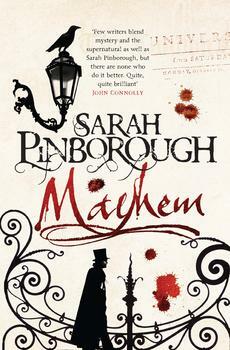 In this tour de force, Sarah Pinborough brings to life what else was going on around that time, and provides an alternate theory to explain some of the many other mysterious deaths in the same period. As with her recent fairy-tale retellings, Pinborough is able to make you look at things that should be familiar in a new light. There’s a description in Mayhem of those who attend the opera and those begging outside it which captures the dichotomy and the hypocrisy of late Victorian London more succinctly than any amount of political screed could achieve, and the gradual disintegration of the central characters of this story – protagonists and antagonists alike – reflects the decay of the metropolis. There’s a supernatural element to the story but the most horrifying parts are those where Pinborough puts the reader in the place of those who are about to undergo the worst experiences. We don’t need to see the killer carry out his deeds: the descriptions of the tools that he has, and the utter paralysing fear that they instil in the victims are enough to allow our imaginations to do their worst. There are gory passages – but some of the worst of these are simply quoted by the author from the ghoulish prose that was penned by journalists in the nineteenth century.